This week finds us with the first frost of the season; not a hard frost but enough to know we've had one. Galinsoga is an excellent indicator of frost. It's highly susceptible and it's everywhere! Basil is another good indicator as is summer squash. Squash often gets the top leaves frosted and they then turn black while the rest of the plant gets to live a while longer. This year we've got summer squash just setting fruits in a poly tunnel so we'll see how they survive the frost. I doubt it got cold enough to damage them much. Cukes lie ready for Johnny's seed processing crew. The picture doesn't do the field justice; it took the full farm crew from 7:30 in the morning to 4:00 in the afternoon to pick and process this cuke. And it took a full day for two people to sluice it. But it was worth it, we got nearly three times what we expected; an excellent yield considering how dry it was this summer. This week we do another cucumber and we'll also finish the tomatoes. We'll hammer away at the few pepper increases we have and get as much fieldwork done as we can. There are still some fall trials to plant so we need to get ground ready for those as well. 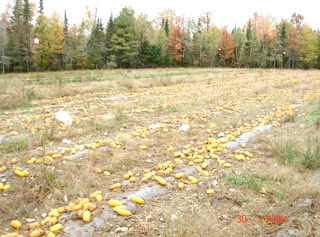 We'll also process at least two cucurbits and get our winter squash breeding fruits in. Sounds like a lot for this week and it's scheduled to rain on Friday. A Great Blue Heron enjoys the view from atop Brian's greenhouse, er make that woodshed/boat storage facility. You can just pick him out on the right side of the greenhouse. I couldn't get any closer as he flew off when I tried. He's getting smarter and more wary of me. He only comes a couple of times a week and hangs out with our ducks and geese. And speaking of greenhouses; this is something I always wanted and we finally bought one. We've had this for at least ten years. We bought it used, tore it down and brought it home where we spent a month putting it back up and making modifications that we needed to. We grew seedlings for several years, grew trellis tomatoes and finally wound up growing hanging baskets filled with cucumbers and flowers for our own use. Most people, us included, don't realize the amount of labor it takes to operate a greenhouse plus work full time. After much thought of what we wanted to do with its primary purpose now is to house some of my firewood, my wood splitter, lawn furniture, and the lawnmower. I also put my boat in there for the winter, my four wheeler and trailer, and assorted pool supplies. 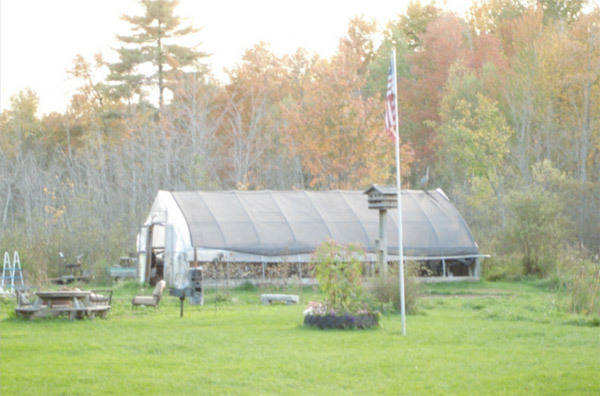 It makes a great storage building and is nice and warm in the winter. Perhaps someday we'll go back into growing our own seedlings.